刘洪祥, 赵彦楠, 霍佳宁, 李达, 马晓欣. 脱氢表雄酮联合高脂饮食诱导大鼠多囊卵巢综合征模型的研究[J]. 中国医科大学学报, 2018, 47(11): 961-963, 974. LIU Hongxiang, ZHAO Yannan, HUO Jianing, LI Da, MA Xiaoxin. Effects of Dehydroepiandrosterone and High-fat Diet on Induction of a Rat Model of Polycystic Ovary Syndrome[J]. Journal of China Medical University, 2018, 47(11): 961-963, 974. Abstract: Objective To investigate the effects of DHEA and DHEA associated with a high-fat diet on a rat model of PCOS. Methods Eighty female, 3-week-old SD rats were randomly allocated to one of three groups:control group (n=30), experimental group (n=30), and high-fat diet (HFD) group (n=20). After treatment for 8 weeks, the serum concentration of TESTO was determined. The pathological changes in the ovary were examined, and the body weight of the rats was measured every 3 days. Results The serum concentrations of TESTO in the experimental group and the HFD group were higher than those in the control group. 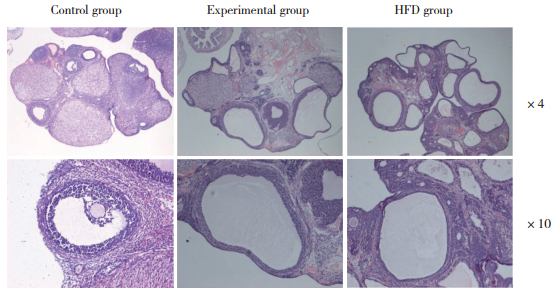 More cystic follicles and thicker theca cells, together with fewer layers of granulosa cells, were observed in the experimental group and the HFD group. However, unlike in the experimental group, the changes in the HFD group were more obvious. Conclusion The combination of DHEA and an HFD can lead to the successful induction of a typical PCOS model in rats. 1）P < 0.05，compared with control group. TESTO，testosterone. 1）P < 0.05，compared with experiment group. 倪倩倩, 朱梦娇, 姚根宏, 等. 高脂肪饮食诱导多囊卵巢综合症的表型改变的实验研究[J]. 医学研究生学报, 2014, 27: 116-119. WRIGHT BE, SVEC F, POTER JR. Central effects of dehydroepiandrosterone in Zucker rats[J]. 1995, 19(12): 887-892.